Combine onion, pepper, celery, garlic, crawfish tails, bread, and egg in a food processor. Pulse the mixture. Do not puree. Pour the mixture into a large bowl and stir in the green onion and parsley. Season with salt and red pepper. In a separate bowl, combine the dried breadcrumbs with the Creole seasoning and mix well. By tablespoonful's, shape the crawfish mixture into small balls. Roll each ball in the breadcrumb mixture. Fill a heavy pot with oil about three inches deep and preheat to 360 degrees. Fry the boulettes until golden brown, about 2 minutes. Drain on a paper towel. 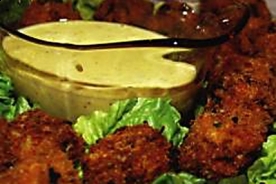 Serve hot with Creole Mustard Sauce. Place egg, garlic, lemon juice, parsley, and green onion in a food processor and puree. While the processor is running, slowly add the olive oil. Once the mixture is pureed, add mustard, salt, and red pepper. Mix well. Cover and refrigerate for an hour before serving with Crawfish Boulettes.